In the case of tow companies operating without proper licensure and permits, how does this not constitute grand theft auto and extortion? I'm not a lawyer and welcome input from those more educated than me in this area, but why can't the people who had their cars towed press criminal charges against either the company or the tow driver? How about the scam of getting your stolen car back! I wrote to the Richmond City Council about the rip off and got a response from one of the councilmembers who had similar outrage over the same type of event. She contacted me and had the incident recorded in the Contra Costa Times in a letter to the editor. What a scam! 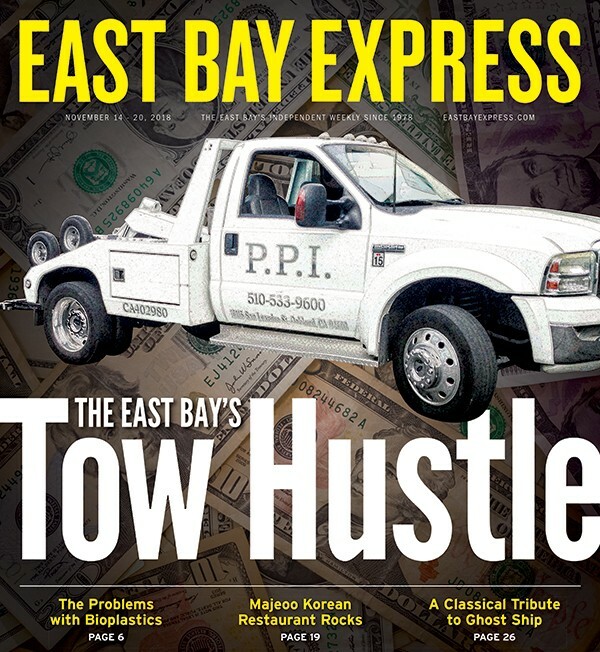 The actions of PPI Towing sound both legally wrongful and mean spirited. We should also note that if you park in a store's private lot and then go shopping elsewhere, you are being abusive. This is not OK. If someone parked in my driveway to visit someone else, I would have them towed in a heartbeat. It takes a lot of nerve to park in someone's driveway or block it. So, why is it OK to park in someone else's private lot out of your personal convenience and ill-founded assumption that the behavior is OK? They had no excuse — including it was only going to be for 30 minutes. Sounds like Discount City has been abused by freeloaders and chose to do something about it. That is not victimizing of the freeloaders — Discount City is not allowing itself to be victimized. This company [PPI Towing] took my car from an unmarked free parking spot when my complex had my vehicle information and the property manager had signed nothing. I paid for about two days-worth of parking when my car was towed overnight on a Friday. This business is a joke. You neglected to point out that Buffy Wicks is also anti-tenant. She came out in opposition to the Proposition 10. In fact, the Express rescinded its endorsement of Wicks after she announced her opposition to Prop 10. Buffy Wicks trounced Jovanka Beckles because she was the far superior candidate on many levels. The money angle is the only thing Beckles supporters could come up with because their candidate lacked the ability to grasp and address complex policy issues and was deeply flawed personally, as shown by the comments of her fellow councilmembers and the fact that her own mayor wouldn't endorse her. We, in Richmond, are so glad to be rid of Beckles and her mean-spirited divisiveness. Thank you, voters, in Assembly District 15. I have eaten there, and I must say the food was really outstanding. This was the best Korean food I've had by far! We have eaten there, and it is an amazing place, with the variety of foods to satisfy a fastidious vegetarian and a gluten-sensitive wife. We were completely pleased but had little room for dessert. We will be more careful next time. It was just too good to stop. Tony Thurmond is the best and the brightest, and the best hope for excellence in public education for every student. I am proud to have walked precincts for him when he first ran for California Assembly. So excited to hear that Tony won. In the gloom of the smoke and the grief with the fires' devastation, this is a joy to read. Congratulations, Tony, from one social worker to another. This was clearly a win for public education! Let's get real about charter schools — you wanna start a school? Then open it to all the students: special education, English language learners, kids with behavioral issues, etc. Charters have been skimming dollars and high-end kids but don't have any better results to show for it. We all knew Tony Thurmond was and is a winner! Now it is official! Thank you to everyone who voted for him and encouraged others to do likewise! But Tony won on his own — campaigning hard, long and hard! Voters of California chose the person who can move education in the right direction! Congratulations, Tony! And good luck! Our family voted for public schools! Way to go, Tony! This is a true win for trees. [GOP incumbent] Catherine Baker inundated voters with 20-plus mailings a week. And if that weren't bad enough, many of those were just slandering her opponent. Karma wins again. Funny how Democrats always win at the last minute after the Republican is out in front. And all of it, generally, by mail-in ballots. Not a surprise to me. I voted by mail early. I was not subject to the smear mailers that Ms. Baker's supporters sent out. Such a waste of paper and money. Smear campaigns should be in the past. Congratulations, Rebecca! This information, along with independent monitor's commentary in a report that OPD was "resisting" fully analyzing its Stop Data (matter discussed at a recent Oakland Police Commission meeting), raise grave concerns about OPD and its leaders taking steps to reform culture and practice necessary to reaching compliance. Mayor Trish Spencer has been an absolute disaster. Good riddance! This place is a gem — been there a bunch of times, and it was fantastic every time. The owner is very nice and attentive. Bring some time, because certain dishes take time to make. I quote: "I bought some nice lamb this morning; I will cook it fresh for you." Hmm. I wonder where I am? Gina Arnold was the first name I thought of. What luck! Still around/alive/here.